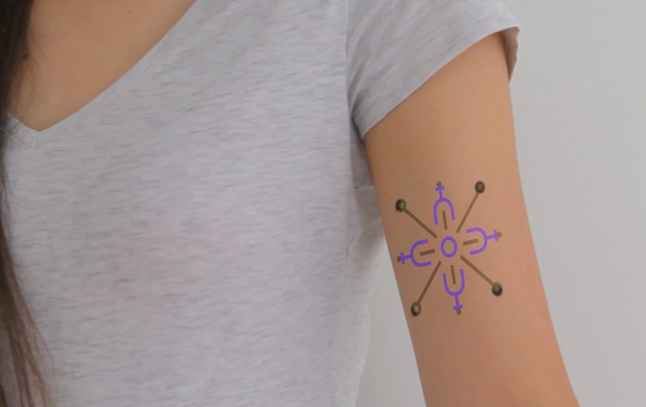 For many people with diabetes, keeping tabs on blood sugar every day is expensive, time-consuming and invasive, but researchers at MIT and Harvard are exploring a creative new approach that could one day help make things easier: biosensing tattoos. The scientists have developed special tattoo ink that contains chemicals that can sense blood sugar levels, pH, and sodium. When blood sugar goes up, for example, the glucose sensing ink changes from blue to brown. When a person's salt levels increase, the sodium sensing ink becomes a more vibrant green under UV light. When alkaline levels shifts, a pH sensor changes from purple to pink. The DermalAbyss ink – still in what scientists call the "proof-of-concept" stage – alters its hues in response to changes in the fluids inside a person's body, MIT Media Lab researcher Xin Liu told CBS News. It literally becomes an interactive display. "People with diabetes email us and say, 'I want to try it out,'" Liu said. For someone with diabetes who has to prick their finger multiple times a day to test their blood sugar level, or who wears pricey blood glucose monitoring equipment that can be cumbersome during activities like swimming, glancing down at a tattoo to check if blood sugar has dropped or spiked could be a lower-maintenance approach to health monitoring. But the technology is still in the very early research stage, Liu points out, and has only been tested on pig skin samples, not living, breathing animals – let alone humans. Liu said there are a lot of unknowns in testing it on living skin, including questions about allergies, accuracy and durability. "It will take a long time for anything practical to go to market, but it [the technology] evokes imaginations and opens up possibilities," said Liu. For some, the idea of a decorative new tattoo that reflects your body chemistry may be appealing. But mostly, the scientists say the goal is to make monitoring of health data easier, safer and as accurate as possible. "People want to understand what's happening in their body," Liu said.